The article, Magnesium Prevents Alzheimer's? provoked the above question from a reader.1 Ever since aluminum cookware was introduced during the "Roaring Twenties" as a good conductor of heat at low price, its safety has been questioned. No amount of aluminum in the human body is considered safe. Before further addressing the subject of aluminum cookware, we will explain some of aluminum's other effects on the body according to Analytical Research Labs. Nervous System: Animal studies show that aluminum reduces this activity, inhibits important enzymes in the brain such as Na-K-ATPase and hexokinase. It may also inhibit uptake of important chemicals by nerve cells (dopamine [Parkinson's], norepinephrine, and 5-hydroxytryptamine). Osteoporosis: While I have seen no studies to support this association, we do know aluminum is laid down in the bones in place of calcium. Behavioral Effects: Dementia from kidney dialysis related to aluminum toxicity is associated with memory and coordination losses, confusion and disorientation. Digestive System: Aluminum reduces intestinal activity. Other conditions associated with possible aluminum toxicity: Besides Alzheimer's and these others, conditions which may be related to aluminum toxicity include ALS, anemia, colitis, dental cavities, hypoparathyroidism, kidney and liver dysfunction, neuromuscular disorders, osteomalacia (also associated with calcium deficiency due to aluminum replacing this mineral in the bones), Parkinson's disease, and peptic ulcers. Early symptoms include flatulence (gas), dry skin and mucous membranes, colic, tendency toward colds, burning pain in head relieved by food, heartburn, and aversion to meat (also associated with mineral deficiency). Advanced symptoms include paralytic muscular conditions, severe memory loss and mental confusion. I have seen literature warning we may never see "definitive scientific proof" that aluminum cookware causes Alzheimer's and motor-visual coordination, though studies have shown a link between those disorders and high aluminum deposits in the brain. Other studies have shown that aluminum cookware may also cause the other symptoms listed above. Hence, we avoid cooking in aluminum. As for the anodized aluminum cookware, manufacturers are saying it's safe for cooking. Dr. Peat disagrees. It is generally accepted that highly acidic foods attract aluminum from cookware. What most do not realize, however, is that highly alkaline foods also absorb this toxic metal, and at an even faster rate than the acidic ones.The resulting aluminum hydroxide gel compounds are converted into acidic aluminum compounds in the stomach. The longer these foods are kept in the cookware, the more of the metal is absorbed by them. Be aware also of "restaurant-imparted toxins." They commonly use large, pitted old aluminum cookware that releases this metal into foods that are cooked and held for long periods. Read labels and check for this toxin in all sorts of products, including supermarket salt. Other sources of aluminum toxicity include aluminum cans (pop and beer), aluminum-containing antacids, antiperspirants, municipal water, baking powder, table salt (use sea salt), processed cheeses, and bleached flour. Today's children often are born with elevated aluminum levels passed from mothers through the placenta. Blood testing is not a reliable test for this; however, it often shows up in hair analyses only after a period of a nutrition and detoxifi-cation program that helps release it from tissues in which it is bound. The FDA-approved hair analysis for heavy metal detection is highly recommended. Contact us for further information. "Here's how to decrease your aluminum level now: Get rid of all aluminum pots and pans, including those with aluminum sandwiched between steel," urges Michael A. Weiner, PhD and Ray Peat, PhD. So which cookware should you use? It depends on with whom you talk. As for other types of cookware, a salesman for very expensive stainless steel cookware didn't think very highly of glass which he demonstrated releases chemicals. I liked the quality of his product, just not the price! Porcelain enamel-coated cast iron or terracotta clay may be fine if they don't contain lead as imports often do. We are convinced of one thing - aluminum is a "no no" for us! "This book is not only recom- mended, but required reading! 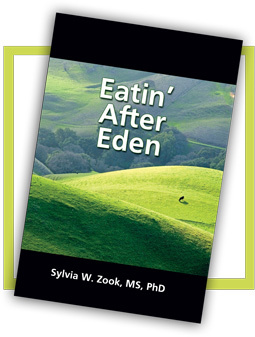 Dr. Zook has put forth a life-changing message of truth that reveals all we need to know about God's divine plan of dietary provision for us... especially in these last days. In an easily understood present- ation, Dr. Zook reveals the shocking consequences of America's rejection of God's plan for eating after Eden—after Genesis 1:29—and His specific instructions for our time. Believe me when I tell you that this is one of the most important books you will ever read! 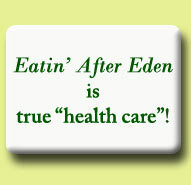 Eatin' After Eden strikes a very healthy balance between expos-ing deception, promoting the sci- ence behind wholesome dietary choices, and imparting the scrip- tural truth."